A pampering, luxurious shower gel featuring unique Style Aromatherapy Natural Ageing technology “NAA”, and fortified with natural Borage Seed Oil and Jojoba Oil that work in harmony to stimulate the skin and leave it cleansed velvety, soft, with a long-lasting subtle fragrance. 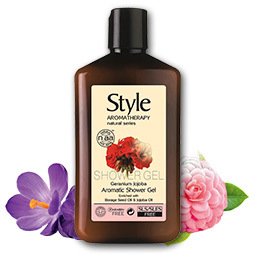 Geranium oil with its earthy fragrance provides a very soothing and comforting effect. Geranium oil is antifungal in nature and also possesses antiseptic properties. Being an antiseptic, it serves as an excellent remedy for treating burns and wounds. Jojoba oil is well-known as the “little miracle” in skin and beauty care. Jojoba oil, rich with vitamin E. It restores moisture that the skin loses on a daily bases. The loss of moisture is what causes the skin to loose elasticity and appear aged. The user-friendly formulation does not contain S.L.S/S.L.E.S and Parabens. Packaging is recyclable.